With the Harris Sisters, Gareth Kiddier and Laurel Swift. A week of imaginative and creative ways to engage with traditional songs, music and dance, and outside-of-the-box ways to illustrate the tales they tell. 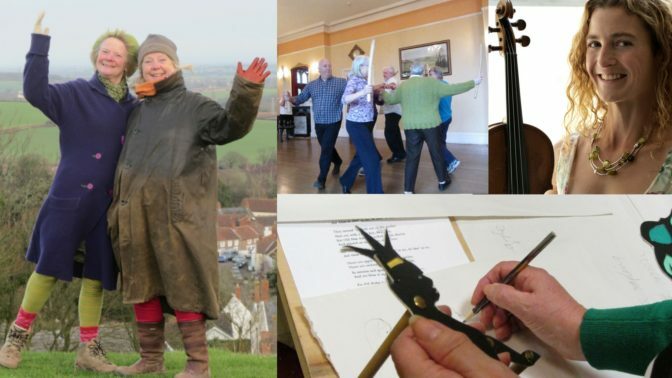 A sociable week of activities that will give participants lots of opportunities to enjoy folk traditions in a variety of ways including; early morning singing, learning traditional tunes and dances (and creating props for them), learning songs to illustrate with shadow puppets, exploring the Quantock Hills, and dancing your socks off in the evenings! Building on the success of last year’s event, sisters Sue and Jeannie Harris will be joined by the highly energetic fiddler and dancer Laurel Swift, with support from Gareth Kiddier, to lead an inspiring programme of folk arts culminating in a light-hearted performance at the end of the week. It’s for everyone! Musicians (any instrument), singers and dancers of all levels of experience including complete beginners. If you are keen to learn more about the English folk tradition, and would like to enjoy working with like-minded people in creating a unique performance, then this is for you. Sue Harris is a Hammered dulcimer player, choir leader and folk artist. She has played with numerous folk acts including Umps and Dumps, Albion Country Band, and John Kirkpatrick. Sue has worked extensively in theatre, including the Royal Shakespeare Company, and written music for a number of radio plays. Her last album ‘Pastorela’ received wide acclaim and was featured on BBC Radio 3. She writes and arranges music for her community band Bandamania and leads several community choirs around the Welsh Borders as well as playing in Polkaworks ceilidh band and recently formed English Dulcimer Duo. Jeannie Harris plays one-row melodeon and was a pivotal member of the 70’s group ‘Magic Lantern’ where she was known as ‘Madame Carrots’. She was a founder member of the original ‘Old Hat Band’ before leaving to live in Scotland. Upon return Jeannie joined forces with Katie Howson to form a duo and they also played together in the reinvented ‘Old Hat’ band. Jeannie is also a qualified music therapist and has done extensive teaching work in special needs education. Gareth Kiddier is well known to Halsway regulars, especially as one half of the English Contra Dance Band. He has been playing on the folk dance scene for over 15 years in bands including The Bismarcks, The Watch and PolkaWorks. He also calls and dances Morris, and his percussive piano style reflects his love of dancing. He once appeared on Crackerjack and Top Of The Pops, but is trying to put that behind him. Laurel Swift is a fiddle player, a dancer and an inspiring instigator of creative new projects and performances rooted in the folk arts. She plays fiddle and viola in dynamic fiddle-singing duo with Ben Moss, double bass with Gadarene, a high-energy band blending obscure 18th century manuscript tunes with modern beats, and fiddle with irresistible ceilidh-dance groovers, The Gloworms. Laurel has choreographed and devised national touring dance productions for Morris Offspring, co-created and performed Under Her Skin with Debs Newbold, advised theatre & film companies on using folk music and dance material. She is in demand to perform and teach at festivals in the UK and America, founded Shooting Roots, which develops youth folk arts projects, and teaches and contributes to education projects in London and nationally.